The reductive process, conveyed through the ideals of the leader of the De Stijl movement, Piet Mondrian, is the starting point of the exhibition. Mondrian’s Tableau Poème from 1928 combines the artist’s most recognizable elements with text by Belgian artist and poet Michel Seuphor and serves as the backbone of the show. 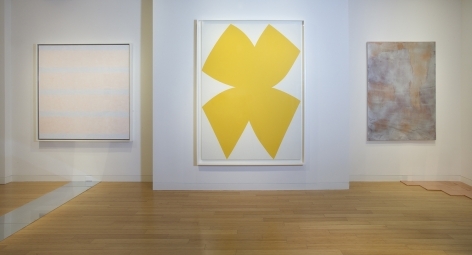 Ellsworth Kelly’s City Island (1958) with its single yellow flower acknowledges Mondrian’s forms rooted in nature. The non-hierarchical treatment of color in Donald Judd’s Menziken wall sculpture (Untitled, 1988) stems from Mondrian’s experimental attempts to balance primaries according to scale, while Carl Andre’s shimmering floor sculptures (Copper Sum Five, 2006 and Fifth Aluminum Cardinal, 1978) remove the hierarchy of display, creating infinite points of view. 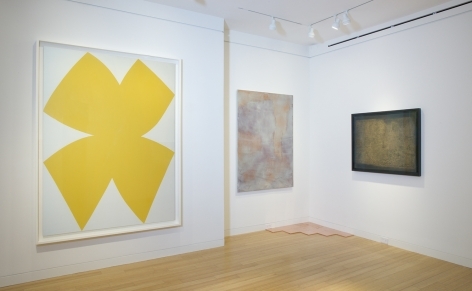 Yves Klein might have read Seuphor’s line “et le soleil tout feu” (“and the all fiery sun”) before creating his fire paintings, represented in the exhibition by Untitled Fire Color Painting (FC 20) from 1962. 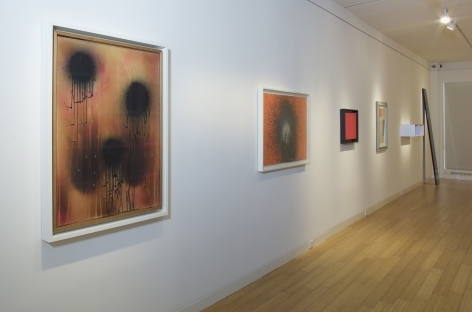 Similarly, Otto Piene affirms light as the source of all life, using fire and later electricity to make work about expansion and freedom – transformation through joy rather than war (Zur Geschichte des lichts, 1959 and Ghost, 1975). In Untitled #17 (1995), Agnes Martin reduces Mondrian’s blue and red primaries to diluted bands of color, creating an ethereal and spiritual effect “suivi des synonymes bonheur sagesse connaissance et de la joie, qu’il ne faut pas confondre encore” (“synonymous with happiness, wisdom, knowledge and joy, that must never be confused again”), using the imperfection of the human hand to highlight the perfection of the mind. 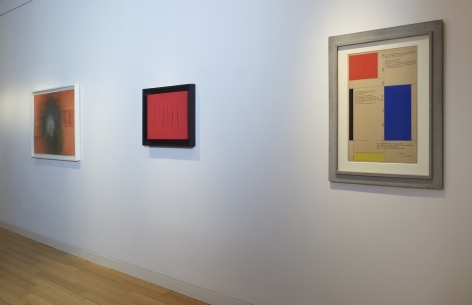 John McCracken’s Black Plank (1988) enters the third dimensional realm, projecting into the viewer’s space, while Lucio Fontana slashes through Mondrian’s red rectangle and into the fourth dimension in Concetto Spaziale, Attese (1964-65). Painting suffers a crisis of faith during the rise of photography and the Pictures Generation, and Rudolf Stingel puts ornament once again on trial, though now by appropriation; Untitled (1992) instructs us how to create a painting, just as Seuphor proclaimed “le néo regard” (“a new way of seeing”) more than six decades earlier. The exhibition will be accompanied by a fully illustrated catalogue with an introductory essay by exhibition curator Meg O’Rourke, essays by Lynn Zelavansky and Caroline Weber, and an interview with Carl Andre.